One day Jesse’s father came home, picked up a fiddle, and played “Callahan”. This impressed young Jesse greatly since he had no idea his father played! 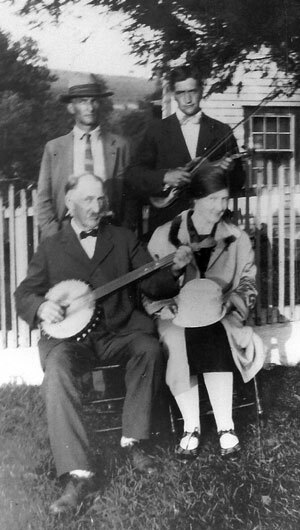 In addition to helping Jesse with his music, Wallace taught his two sons, Tump and Babe, to play fiddle. Babe appears on “The Virginia Old Time Fiddlers” record, County #201. In the years 1906-1914, the Shelor family spent time in the factory towns of Danville, Virginia and Spray, North Carolina working in the cotton mills. In Danville, Jesse and his older brother Pyrhus (pronounced “Purse”) began to play music with the boy across the street, Charlie LaPrade. Charlie played more modern tunes such as “Over the Waves” and “Under the Double Eagle”. Jesse learned these tunes from Charlie and, in addition, learned to carry Charlie home in a wheelbarrow after Charlie stole drinks of whiskey. Charlie went on to join a major old time band, the “Blue Ridge Highballers”, whose seventy-eight rpm reissues can be heard on County #407. 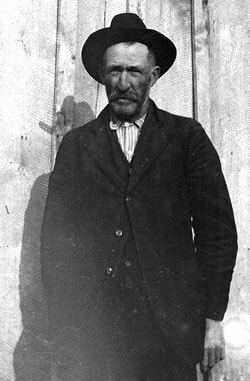 Jesse was drafted into the army during World War 1. Discharged after his entire division was almost destroyed by the great Spanish-Victoria flu, Jesse returned to the Meadows of Dan. He renewed his music by playing with his old mentor, Wallace Spangler and with Joseph Blackard, who often played clawhammer banjo with Wallace. Jesse also renewed his friendship with Joe Blackard’s two piano playing daughters, Lorna and Clarice. 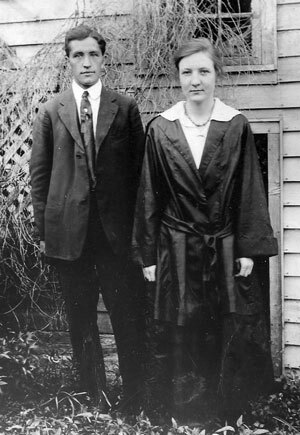 In 1919, Jesse married Clarice Blackard and they began to play music nightly in their home with Pyrhus and Joseph. This then brings the fourth musical family into the story, the Blackard Family. Clarice (born March, 1900) remembers stories about her father Joseph’s childhood: “You know Grandpa (Willoughby Blackard) died in the Civil War with the measles and left Grandma with five children to raise. She had a real hard time. Sometimes she couldn’t buy wax to make candles for the children to study by. He (Joe Blackard) was so anxious to learn that he’d go cut pine and burn it and study his lessons by the light the pines would give out of the fireplace. Joseph continued to a higher education than most by walking seven miles to Vesta every summer to learn from a visiting professor. Finally, Joseph be came a teacher for the mountain children by carrying around a petition to form a “subscription” school Clarice told me, “the people that weren’t able to pay, he took ’em in free an’ taught ’em. But there’s plenty people that was able to put in sornething that did.” In 1904 Joe began to carry the mail and stopped teaching. He carried the mail for twenty-one years, until 1924. Joseph began singing and playing the banjo when he was so young that he had to put the rim on a chair and just hold the neck. Later, he bought the first “store” banjo ever to come to the area. Finally, he ordered a Sears and Roebuck metal-clad “Supertone.” When, in 1918, Cecil Sharp came collecting songs for his book English Folksongs From the Southern Mountains, he found Joe Blackard a rich source. He collected songs like “Young Beichan”, “The Holy Twig”, “Fine Sally”, and “Bow and Balance to Me” from Joe. Growing up in the Blue Ridge Mountains had many riches. Clarice still remembers fondly the vast amounts of chestnut trees in the area. 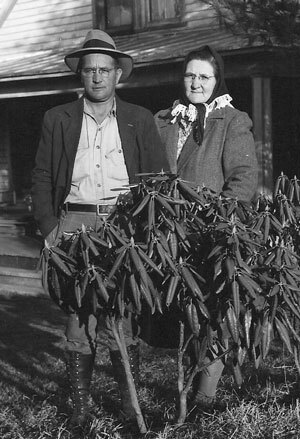 In the early 1900’5 the Blackard and Shelor children would gather many of the sixty pound bushel bags of chestnuts. They then traded them to a local store for “script” money, which was cashed in at the store to buy shoes and clothes. The stores shipped the chestnuts in long, slim, aerated bags to Baltimore. On a good day, the combined efforts of the children could net twenty-five dollars, quite a haul, considering that mill wages were one dollar a day at the time. However, this treasure hunt soon came to an end. In 1904, a chestnut tree in the Bronx Botanical garden contracted Endothia Parasitica, a virulent fungus blight that produced cankers cutting off the sap flow and thus killing the tree. By 1924 the disease had spread and all the chestnut trees in the Blue Ridge were dead. Clarice remembers her father fondly: “He wasn’t rough on us in any way. But he was firm. When he said we didn’t do anything, we didn’t do it. We sort of teased Ma into lettin’ us do things but we couldn’t him.” Clarice loved to be around her father: “Well, I liked things I could do with Pa better than 1 liked house work. I stayed outdoors with him and my sister stayed in the house and learned to cook and sew and do things like that.” Clarice eventually became the substitute mail carrier for her father. She explained tome how she learned to ride: “Pa would just stick us on a horse, and we’s just little bitty things, and say ‘hold on’. I wish I had a nickel for everyone I tumbled off.” Clarice was carrying the mail for thirty miles in the mountains by the time she was seventeen. Both sides of Clarice’s family are musical, On her mother’s side, the Pendletons, there are many fine musicians. Clarice’s nephew, Buddy Pendleton, is a champion bluegrass fiddler. Buddy learned a great deal from his uncle Delmar Pendleton (Delmar can be heard on “Old Originals” Vol. I, Rounder 0057.) However, it was Clarice’s father who influenced her most musically. Her father, Joseph, sent Clarice to “singing” school every summer. The school would be a full day and lasted two weeks. At night, Joe helped Clarice associate the new shape notes with the more familiar “do-re-mi-fa-so-la-ti-do”. Even though there was a pedal organ in the Blackard home, Clarice begged for a piano. When she was seven, she got one. Joe now wrote “C-D-E-F-G-A-B-C” on paper and put them behind the white piano keys. Again Clarice learned to associate these letters with “do-re-mi-fa-so-la-ti-do”. At first, Clarice only played melody behind her father’s singing and banjo playing. He’d stop and correct Clarice’s every mistake. Then, she added the bass notes. Finally, using her imagination, she added her own special notes to the tunes. When Clarice was thirteen, she could play even the fastest tunes up to tempo. That meant music nightly in the Blackard home. Even after Jesse and Clarice were married and had their first child, Joseph C. Shelor in 1920, the music continued in their home throughout the decade. The music would have stayed only in the home, except for a talent search by Victor Records. The owner of a victrola record store in Hillsville, Mr. Walter Howlette, held auditions for local bands and Joe Blackard brought his group. The Victor Record representative liked them and gave them a recording date in Bristol, located in the southwest corner of Virginia, 125 miles away. 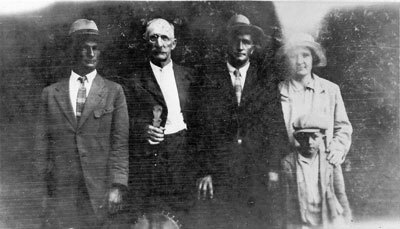 Joe, Clarice, Jesse, Pyrhus, and seven year old Joseph arrived in Bristol on August 2, 1927. The recording session took place in a dusty millinery shop. They were asked to sing some of their more unusual songs although they hadn’t practiced for them. Joe had to write the words out for Clarice and placed them on the piano. Pyrhus patted his foot so loudly that they finally had to put a pillow under his foot. Little Joseph was crying and getting dirt from the shelves on his face. Even with these less than ideal recording conditions, the group cut “Sandy River Belle”, “Big Ben Gal” (incorrectly labeled Big Bend Gal), “Billy Grimes the Rover”, and “Suzanna Gal”, producing four sides on two seventy-eight rpm records. The trip back made the recording session seem like a cream puff. They left Bristol before dark. Crossing New River by ferry, they had to straddle large holes in the ferry’s rotting timber and at the same time, calm Little Joseph. After that it was driving in complete fog. Jesse drove for hours with his head sticking out of the window. They arrived home at three A.M. Jesse had a stiff neck that lasted days. Even though the family was asked back to record, they never returned. The music in the home entered a new phase when Jesse, because he worked on the state roads, had been away from home a great deal. Jesse and Clarice had six children of whom three, Joseph, Paul, and Jimmy, became particularly interested in playing music. At the same time, Jesse’s brother Frank, a singing master, had six children interested in music. One in particular, Bill Shelor, became an excellent fiddler, guitarist, and singer. The cousins would then meet every night and make music. This way Clarice never had to worry and knew where her children were every night. Finally, World War II broke up this phase, making its demands on the family. Currently all the children bring their families over every Sunday. Paul’s daughter, Susan Shelor, has learned many of her Grandmother Clarice’s piano pieces. Even though Jesse is partially paralyzed due to a toxic garden spray, Susan can get him to do his favorite tune, “Callahan”. And so the tradition is passed on.